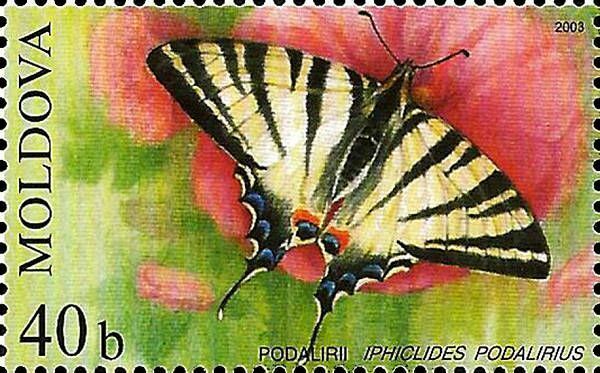 On 30 April 2003, the Post Office of Moldova (Poșta Moldovei) issued a series of postage stamps with the title Butterflies and Moths (II). The issue comprises four stamps, with associated cancellation (postmark) and first day cover (FDC). The designer was Elena Karacenţev. The printing was performed by Cartor Security Printing, France. This article uses material from the Wikipedia article 'List_of_butterflies_of_Moldova', which is released under the Creative Commons Attribution-Share-Alike License 3.0. The Scarce Swallowtail (Iphiclides podalirius) is a Palearctic swallowtail butterfly found in gardens, fields and open woodlands. First described by Linnaeus in 1758, it is found in places with sloe thickets and particularly orchards. It is also called Sail Swallowtail or Pear-tree Swallowtail. The Southern Swallowtail (Iphiclides feisthamelii), is sometimes treated as a subspecies. Despite the name ('scarce'), this swallowtail is quite common. Read more.. This article uses material from the Wikipedia article 'Scarce_Swallowtail', which is released under the Creative Commons Attribution-Share-Alike License 3.0. 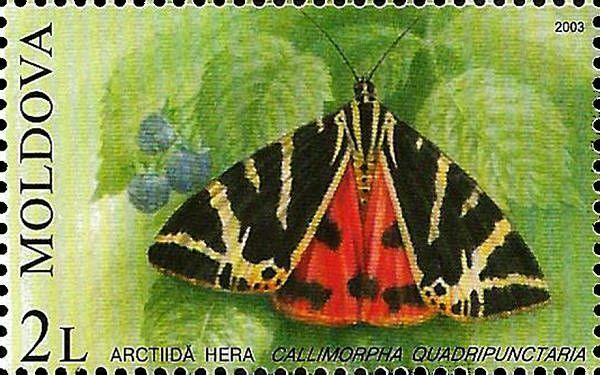 The Jersey Tiger, Euplagia quadripunctaria, is a day-flying moth of the family Arctiidae. The adult wingspan is 52–65 millimetres (2.0–2.6 in), and they fly from July to September, depending on the location. They tend to fly close to Eupatorium cannabinum, where they are hard to notice because of their camouflage. Read more.. This article uses material from the Wikipedia article 'Euplagia_quadripunctaria', which is released under the Creative Commons Attribution-Share-Alike License 3.0. 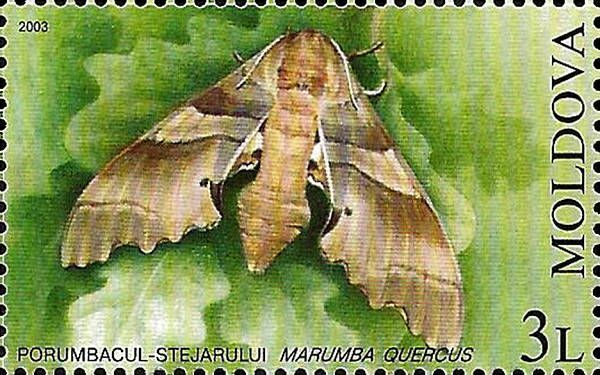 The Oak Hawk-moth (Marumba quercus) is a moth of the family Sphingidae. It is found in Southern Europe, North Africa, the Near East and Mesopotamia. Read more.. This article uses material from the Wikipedia article 'Marumba_quercus', which is released under the Creative Commons Attribution-Share-Alike License 3.0. 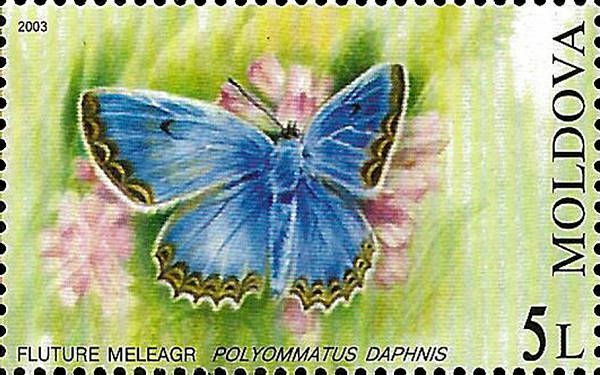 The Meleager's Blue (Polyommatus daphnis) is a butterfly of the Lycaenidae family. It is found in Eastern and Southern Europe and Western Asia, from Southern Poland ranging to the Balkans and Turkey. Read more.. This article uses material from the Wikipedia article 'Polyommatus_daphnis', which is released under the Creative Commons Attribution-Share-Alike License 3.0.